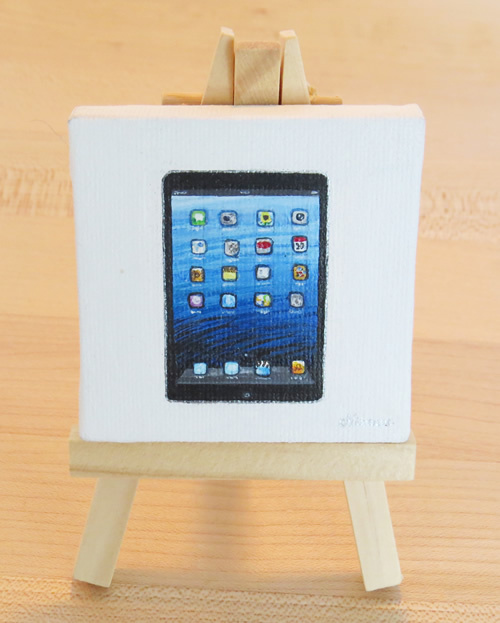 "iPad Mini" I present to you my latest offering, a very mini iPad mini! 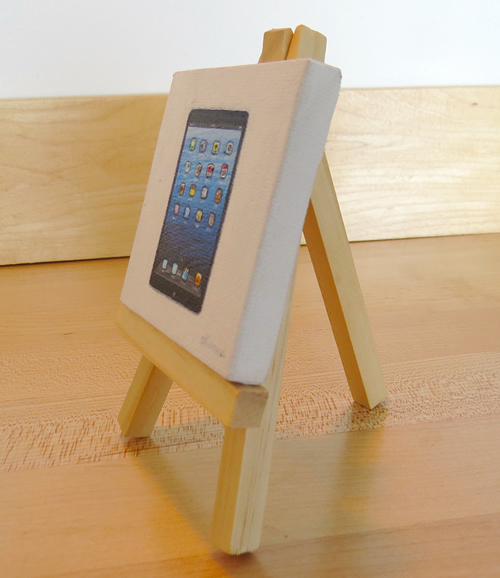 It's an adorable miniature painting, that comes with an equally adorable miniature easel. I completed this painting several months ago, and it has been residing proudly on my dining room table the whole time since. I've really enjoyed looking at it, and I guess, I secretly wanted to keep it. This painting is a little jewel. The subject matter makes you want to touch its screen and swipe the icons to the next page, or open an app. 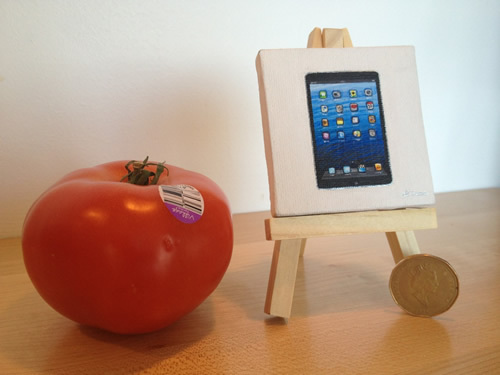 You'll instantly wish Apple made a real mini iPad mini! It's a moment suspended in time, with its tiny peaceful home-screen reduced to an extremely mini size. Besides being very convenient for display (it can fit on almost any desk or shelf) the tiny size of the painting insists that you move as close as possible to it to get a good look. It's a very intimate experience, one that not's unlike our relationship with real tablets. You will be able to recognize most of the apps, as I worked quite hard to get as much detail as possible into the small space. I imagine that's what Apple did when designing the iPad mini, too. They pay such meticulous attention to every tiny detail, and I wanted to capture that marvelous obsession on an even smaller scale. I hope the new owner of this delightful painting will enjoy it as much as Snaggy and I have. 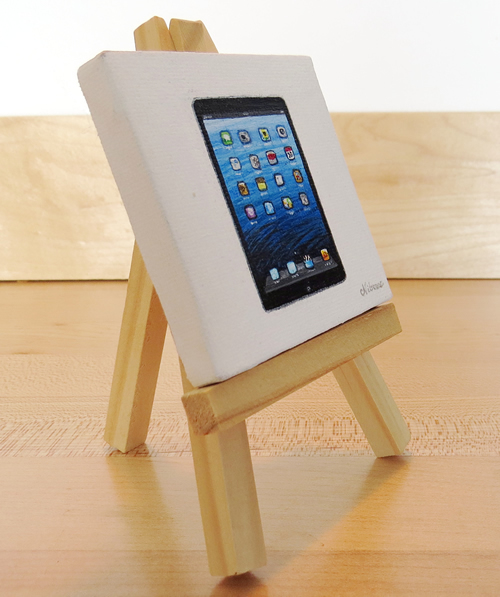 It looks amazing on the 5" tall mini easel, or it would also look pretty neat with both easel and painting displayed on a wall. 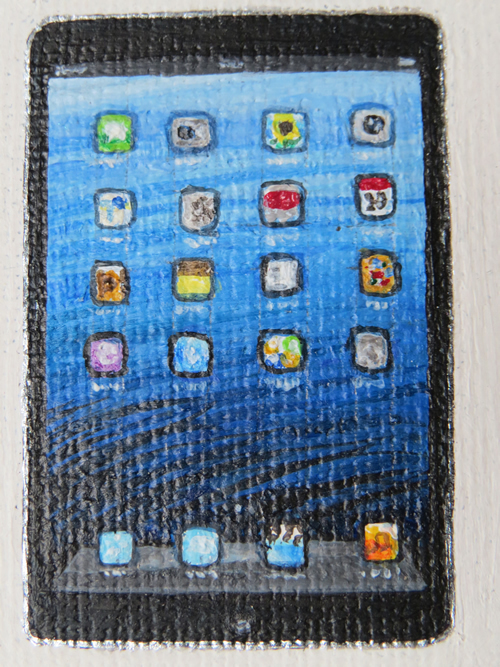 Details: "iPad mini" original painting, on 2.5 x 2.5 inch stretched canvas with a wooden frame. 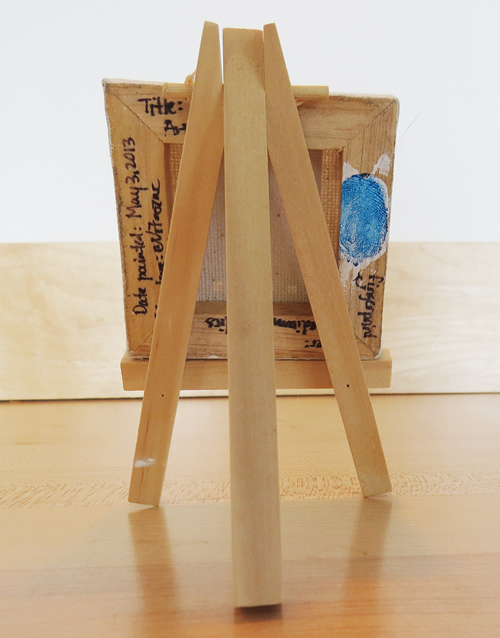 The tiny wooden easel is also included with the painting. The two together stand about 5" high. The back of the painting contains the title, the date painted, Nitrozac's signature, and a fingerprint for authenticity. Best of luck to all bidders, and to the winner, I know you will adore this painting as much as I do. It was a lot of fun to paint and to be honest, it will be very hard to part with this little fella!